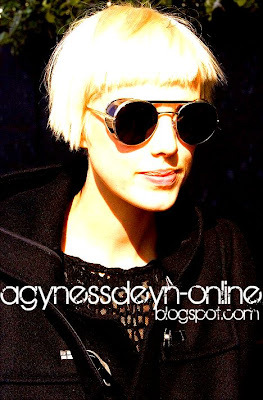 With her incredible bone structure and platinum blonde hair supermodel Agyness Deyn is a trend setter. 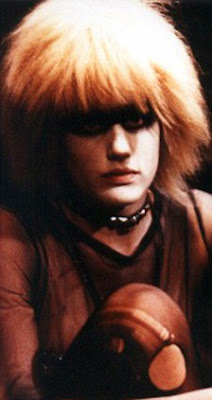 But her latest look appears to owe at least a little inspiration to another style forward individual - Daryl Hannah's iconic look in the 1982 film Blade Runner. The thick black glasses added to the dark gothic look, with her fashion forward black lace dress and warm duffel coat. out and about in Stockholm in Sweden with her fiancé Albert Hammond Jr. They shared a tender moment face to face by the car, staring lovingly into each others eyes. 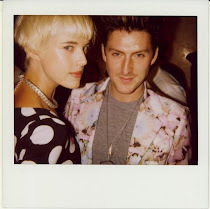 Agyness is enjoying spending some time with Hammond after working hard on the runway at London Fashion show last week. 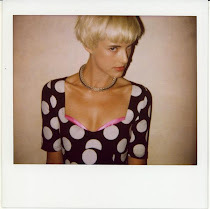 The Lancashire lass returned to London from her New York home to support her friends Henry Holland, at his House of Holland Show, and Giles Deacon, on the runway for Giles.